American Association of State Highway and Transportation Officials (AASHTO) has approved a National Corridor Plan laying out the framework and guidelines for the development of this 50,000 mile system. The U.S. Bicycle Route System is a proposed national network of bicycle routes that span multiple states and are of national and regional significance. These routes are selected and maintained by State Departments of Transportation (DOTs), and designated and catalogued by AASHTO. This is a very significant development for us touring cyclists. For the longest time I had to piece together routes from Adv cycling, Delorme, Mapquest etc. Why is the numbering system just the opposite to the Interstate Highway System? Look at it closely. It is the same system as the US Route System. No its not! Bike Rt95 is on the west coast. Interstate 95 is the east! The same inversion goes north south too. 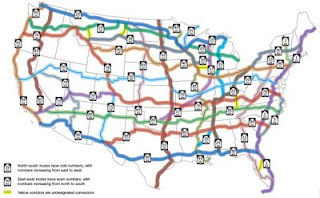 The US Route system (think of US 1 or US 30 in Philadelphia) is not the same as the Interstate system.